President George W. Bush will propose freezing most domestic spending in his upcoming 2009 budget and will seek big cost savings from government health care programs, a U.S. official said on Thursday. Bush's final budget is due out next week. David Rust, Social Security's Acting Deputy Commissioner for Disability and Income Security Programs, testified today before the Subcommittee on Federal Financial Management, Government Information and International Security of the Senate Committee on Homeland Security and Governmental Affairs on the subject of "preventing, detecting, and collecting improper payments." Rust's written statement is available online. The President's Budget for FY 2009 includes a proposal to provide SSA with funding, outside the spending caps, for program integrity activities such as CDRs and SSI redeterminations. The Budget includes a special funding mechanism that will provide $240 million for SSA's program integrity efforts, in addition to the $264 million already included in the base request, for a total of $504 million. SSA plans to process 329,000 medical CDRs and nearly 1.5 million SSI redeterminations in FY 2009. If found to be as cost-effective as SSI redeterminations, up to $40 million may be used for initiatives to improve the disability process and up to $34 million may be used to expand the Access to Financial Information project, which automates verification of SSI recipients' assets held in banks. In total, SSA estimates this program integrity funding in FY 2009 will result in over $4 billion in savings over 10 years. The Social Security Administration has posted a notice of a proposed settlement agreement and hearing in the Kaplan v. Chertoff class action pending in the Eastern District of Pennsylvania. The class action has to do with delays at the Department of Homeland Security in adjudicating applications for adjustment of immigration status and naturalization. Those delays have had serious impacts upon immigrants who receive Supplemental Security Income (SSI), because of time limits for SSI benefits for some immigrants. Jonathan Stein of Community Legal Services of Philadelphia is class counsel. - What are your options if you want to hire representation? - How knowledgeable and experienced is the organization in representing individuals applying for SSDI? You should look for a representative who specializes in SSDI who understand the complexities and nuances of the process. Don’t be fooled if a representative tries to impress you with their local influence. It’s highly unlikely that they have special power over local SSA staff or can ensure your hearing will take place in front of a specific judge. - Will the organization help you file the initial application for SSDI? The myth that you cannot have a representative help you file your initial application for SSDI may stem from the fact that many attorneys only accept SSDI clients after their applications are denied. - What specific activities will the representative undertake on your behalf? - Will you contact my doctors and collect or update medical records for my file independently of the SSA? - Will you regularly query the SSA for status of my claim or confirm my claim file is up-to-date? “The SSA’s Disability Determination Service may arrange for you to visit a doctor of its choice and compile your medical records,” Swierczek explained. “But it’s generally in your best interest to have your representative help you by having your treating physician provide the needed medical evidence. “Likewise, your representative should regularly be following up with the SSA to ensure your claim is in order. You don’t want to show up at a hearing only to learn critical information, such as your most recent medical tests showing your illness has worsened, did not make it into your file in time,” he added. - Does the organization have experience representing someone with your disability? Not all disabilities are alike — the SSA has specific Disability Impairment Criteria for hundreds of specific conditions, from AIDS to strokes. It’s essential to prepare each case with details and in the language required by the SSA to avoid unnecessary delays, a reduced award or denial of benefits. - How does the organization – and who within the organization – will keep you informed on the progress of your claim? Disability applicants should make sure that the representation organization they choose will keep them regularly updated on the progress of their application, including timely notices of deadlines, documents required or scheduled hearings. - Will you have to attend any hearings? Approximately one-quarter of SSDI cases proceed to the hearing level where there are hearings before judges. However, this might not be necessary if the representative asks for and receives an “on-the-record” decision, where the judge makes a decision based on a review of information in the file. It does require that your representative create a well-written brief that provides a thorough, factual record of your claim. For example, 63 percent of Allsup customers at this phase never have to attend a hearing because many judges will make a decision without the need for an oral hearing based on the information Allsup presents. - What is the organization’s success rate? No organization has a 100-percent track record, but consumers should look for a representative with a high success rate in gaining SSDI benefits for its clients. This indicates the representative not only can deliver the desired result, but also probably has a powerful credibility in the industry. - How much faster can the organization help you win your award? There is no guaranteed timeline. External factors, including the growing backlog at the SSA in processing claims, can affect the timing. But a representative should know on average how long it takes their clients to get through the various stages of the SSDI process. For example, individuals Allsup represents at the hearing level (where 84 percent of all claimants have representation) generally receive an award four months faster than the national average. “How fast you get through the process matters, because it gives you access sooner to the SSDI award you need to pay for daily living expenses. It also lowers your representation fee,” said Swierczek. The SSA determines the maximum fee that any organization can charge for SSDI representation. Currently, it is 25 percent of the retroactive dollar amount awarded, not to exceed $5,300. Those who are approved quickly at the application level and receive no retroactive award pay much less – as little as $750. You should not pay a fee if you don’t receive your SSDI award. However, you should ask a representative if they charge for costs in addition to the representation fee, such as travel or medical records. Take a look at the front page of today's Baltimore Sun. No mention of Robert Ball's death. I am unable to determine online whether the Baltimore Sun even carried an obituary for Robert Ball! Certainly, there was no major article on Ball's passage. The Social Security Administration is the largest employer in the Baltimore area. Robert Ball was arguably the most important figure in the history of the Social Security Administration. I cannot comprehend the Baltimore Sun's studied indifference to the Social Security Administration. Is this ideological? Is it because the Baltimore Sun is just a bad newspaper? Is it because the Social Security Administration is located somewhat on the periphery of Baltimore? This would allow virtually all recipients of benefits under Title II of the Social Security Act a rebate. I had been uncertain of this, since press reports had emphasized that the Senate Finance version of the economic stimulus package would give rebates to "seniors" on Social Security. Of course, there are many drawing disability and survivors benefits from Social Security who are not "seniors." The Senate Finance bill would exclude almost all Supplemental Security Income (SSI) only recipients. I have been unable to determine whether the rebate checks would be counted as income for purposes of SSI. If so, concurrent recipients of both Title II and SSI benefits would receive a rebate check, but would then lose most, if not all of it, because it would reduce their SSI benefits. In fact, they could actually end up worse off if the rebate check were enough to knock them out of Medicaid altogether for a month. The Social Security Administration (SSA) today notified Congress that the agency would suspend some parts of a controversial proposed regulation that would sharply restrict appeal rights for severely disabled individuals applying for benefits. Under the proposed regulation, severely disabled persons would have been denied access to over $2.0 billion in Social Security and Supplemental Security Income (SSI) benefits over the next ten years – not because their disabilities were not severe enough, but because they could not successfully navigate the complex new procedural requirements established by the proposed rule. Those denied would also have lost access to critical Medicare and Medicaid benefits. "This proposal would have complicated the disability system and denied benefits to deserving folks – I commend the SSA for reconsidering it," said Ways and Means Committee Chairman Charles B. Rangel (D-NY). "We should be looking for ways to improve, not complicate, the current disability system. Our immediate priority is making sure SSA has enough disability claims examiners and judges to dramatically reduce the backlog of unprocessed claims. In the future, I look forward to working with the agency to ensure that the right balance is struck between speedy processing and adjudicating claims in a way that is thorough, fair, and accessible to claimants." The proposed regulation engendered a strong outcry from Congress and advocacy organizations. A letter objecting to the regulation was sent in December by eleven House Committee and Subcommittee chairs. Letters objecting to the proposal were also sent by the Senate Finance Committee and other Senate leaders, and almost 500 comments were filed on the regulation, primarily in opposition. "I am pleased that Social Security Commissioner Astrue has pledged to work with Congress to improve the disability process," said Ways and Means Social Security Subcommittee Chairman Michael R. McNulty (D-NY). "It is essential that SSA bring down the backlog in a way that does not harm those we are trying to help. In my view, the most important thing we can do is to work together to ensure that SSA has sufficient resources to process the claims it receives without imposing intolerable waits and hardships on those suffering from severe disabilities." The agency has agreed to suspend some portions of the regulation and will seek additional public input. However, it remains to be seen whether all aspects of the regulation that would unfairly harm disability applicants will be revised. The Committee on Ways and Means will continue to provide close oversight of the process and any proposed changes. I am saddened to report that former Social Security Commissioner Robert M. Ball died late last night after a brief illness. He was 93. Bob Ball was the longest-serving Commissioner in Social Security history, having served in that position from 1962-1973. Prior to being named Commissioner, he held many management positions, starting his SSA career in a field office in 1939. He served as Commissioner under three different Presidents. After leaving the agency, Mr. Ball continued his involvement with the Social Security program, helping to found the National Academy of Social Insurance in 1986. On a personal note, I want to say that Bob Ball left an indelible mark on the Social Security programs and the agency in that he played a critical role in the establishment of Medicare. His commitment to Social Security was unequaled, and he will be remembered as a great leader. You probably don't know his name. And you probably won't see any news of his passing outside of the obit section. But Bob Ball, who died last night at the age of 93, probably played a greater role in expanding and defending Social Security than anyone in the second half of the 20th century. Ball became a Field Assistant in the Social Security Board's New Jersey field office in 1939. He became Assistant Director of the Bureau of Old Age and Survivors Insurance in 1949. Later he became Deputy Director and then Acting Director. In 1962, President Kennedy appointed Ball a Commissioner of Social Security, where he remained until 1973. Probably most significant was Ball's advocacy of Social Security and social insurance more generally after his retirement. He was a key member of the Greenspan Commission which made the program solvent well into the middle of the 21st century. And he was around as a key behind the scenes player as recently as President Bush's failed 2005 effort to phase out Social Security and replace it with a system of private accounts. News Channel 7 in Greenville, SC reports that the Greenville District Office of the Social Security Administration will reopen tomorrow after being closed since last week by a flood. As dry as it is in this part of the world, I can just about guarantee that this temporary office closure was caused by a plumbing problem. Q: What is your new focus? A: "Our focus these days is really aggressively going toward the disabled consumer. "Our future really lies in being able to go directly to the disabled consumer to continue to grow the core Social Security service, but at the same time, we're expanding the portfolio of services that we provide to that disabled consumer so that we're providing a complete range of both financial and health-care services for the disabled consumer. "The majority of our business in the past has been commercially based where we contract with large insurance carriers and Fortune 500 employers around the country to provide our services to their disabled employees and disabled insurers. And they pay the fee because they have a financial stake in the outcome of what we do. So our focus, up until now, our primary focus has been on companies that have employer-provided, long-term disability benefit plans. And the reason being is that these plans and Social Security, and every dollar we obtain from Social Security, reduces their liability by a dollar. However, only one out of every three employees are the U.S. is covered by an employer-provided, long-term disability plan, which means two out of three employees aren't. So we really have a concentrated focus now to go directly to the disabled consumer." This does not begin to solve all the problems associated with the proposed rules. Click on each page to view full size. Ending reopening for new and material evidence is a major element of this proposal that remains, for instance. That may be the largest part of the $2 billion cost saving associated with this proposal. Senator Max Baucus, the chairman of the Senate Finance Committee, has announced his version of an economic stimulus plan. Baucus' plan would differ from the President's plan and the plan that the House of Representatives is working on in several important respects, but for our purposes the big difference is that recipients of Social Security benefits, presumably including disability benefits, would receive rebates of $500 each from the government. If this happens, I wonder what the effect will be on those who also receive Supplemental Security Income (SSI) benefits. It would be cruel to give them a check for $500 -- but then reduce their SSI by $500. Every member in this chamber knows that spending on entitlement programs like Social Security, Medicare and Medicaid is growing faster than we can afford. And we all know the painful choices ahead if America stays on this path: massive tax increases, sudden and drastic cuts in benefits, or crippling deficits. I have laid out proposals to reform these programs. Now I ask members of Congress to offer your proposals and come up with a bipartisan solution to save these vital programs for our children and grandchildren. Council 220 of the American Federation of Government Employees (AFGE), which represents many thousands of Social Security Administration employees, has issued its January 2008 newsletter. About the current state of labor/management relations within Social Security, Fredericksen is very frank: “It’s ugly,” she says without hesitation. “In the past we had some bad moments, even under partnership, but we got a lot more information. The agency now believes it can do pretty much whatever it wants and management doesn’t think it has to follow the contract. Senate Democrats are planning to add a few things to a bipartisan $150 billion economic stimulus package. Senior Senate aides in both parties say the Senate is planning to draft its own measure to add rebates for senior citizens living off Social Security and an extension of unemployment benefits. Adding to the plan would be in direct defiance with White House wishes, as President Bush has called on Congress to quickly adopt the original plan. Bush has said additional spending measures could derail the deal. This letter provides comments on the Notice of Proposed Rulemaking (NPRM) entitled, “Amendments to the Administrative Law Judge (ALJ), Appeals Council, and Decision Review Board Appeals Levels,” published in the Federal Register on October 29, 2007 (72 FR 61218). The proposed changes in this NPRM raise many concerns. The Social Security Administration should undertake a more detailed discussion before taking any final actions on these proposed rules. Changing the rules for medical and vocational evidence submission. This NPRM seems to restrict the ability of claimants and their representatives to submit critical evidence during the period from five days before the hearing to the issuance of the ALJ decision. While some efficiency is necessary, it seems inappropriate to enforce strict rules when claimants and their representatives do not necessarily have control over when and how evidence is made available. For example, we question whether claimants should be held accountable for the responsiveness of health care providers. The Social Security Act requires SSA to accept new evidence adduced at a hearing. It would exceed SSA’s statutory authority systematically to disallow that evidence. Formalizing the appeals process. We have concerns about increasing ALJs’ opportunities to dismiss cases based on the claimants’ ability to attend pre- or posthearing meetings. The NPRM will leave the ALJ significant latitude on this issue, and this may compromise claimants’ due process rights and their access to the appeals process. Closing the record. While closing the record will simplify the legal procedures, it is at the expense of the affected claimant. This NPRM achieves its estimated $1.5 billion cost savings from attrition; the denied claimant who would have been allowed benefits either chooses not to reapply or dies in the interim. This change may also cause evidence to be excluded from further consideration during a reapplication hearing. This is an unacceptable means of simplifying procedures. It is also less effective in decreasing backlogs. Those whose appeal to the ALJ fails will be encouraged to submit new applications, and even a streamlined reapplication process will only increase the backlogs at the field office and disability determination services offices. Shifting a backlog is not an effective solution. We look forward to further discussions regarding these and other issues prior to any final actions on this NPRM. We look forward to continuing to work with you to better serve the American public. Please contact [staff] at the Finance Committee to schedule a meeting to explore these issues. I had posted that Administrative Law Judge (ALJ) Kevin Duggan will become the new Hearing Office Chief Administrative Law Judge in Fort Lauderdale. By mistake, the caption on that post indicated that Duggan was going to Orlando. The body of the post is correct. ALJ Duggan is going to Fort Lauderdale, not Orlando. I should have noted at the time that ALJ Duggan has been active in the ALJ Association, which is a union which represents Social Security ALJs. My understanding is that taking a HOCALJ position would put Duggan in management and no longer eligible to be a union member. Next month the Social Security Administration plans to begin what is, for that agency at least, a veritable hiring binge. It will be offering jobs to 150 administrative law judges, who will be responsible for deciding when sick workers are too disabled to return to work. Such staffing expansions ordinarily don’t register more than a blip within the vast federal bureaucracy. But the effort over the next year is expected to reveal whether the Social Security system is equipped to deal with an anticipated crush of baby boomers in their 50s and 60s who suffer from chronic diseases and serious workplace injuries. Max Baucus, the Montana Democrat who chairs the Senate Finance Committee, which would take the lead in writing any legislation to change the Social Security system, was more direct addressing the situation last year, blaming the Bush administration for imposing domestic spending cuts that compelled Congress, in his view, to underfund the Social Security Administration. The tone is prompting Social Security’s top official to focus on short-term. Each year from fiscal 2000 to 2007, Congress appropriated less money for the Social Security Administration’s administrative accounts than the president requested, according to the Social Security Advisory Board, an independent panel. Spurred by the disability backlog, Congress gave the agency $150 million more than President Bush requested for fiscal 2008, which is how Astrue can afford his hiring binge. Astrue worries about the effects disabilities are having on the system’s long-term costs, noting findings that show that since 1985, the amount of Social Security’s total spending consumed by disability benefits has increased from 10 percent to 17 percent. It is only after an appropriations bill has been passed that Astrue is willing to talk this way. We will soon see his budget request for fiscal year 2009, which will tell us whether he really has gotten the message. Note also that Astrue cannot talk about how his agency has been bled dry without also expressing a desire that fewer people draw Social Security disability benefits. Other than his father, I wonder how many Social Security disability claimants and recipients Astrue has ever met. Require SSA to inform Congress of changes to how it staffs offices at least 3 months before a proposed change could be implemented. “The American Federation of Government Employees (AFGE) fully supports the efforts of Congressman Brian Higgins to introduce legislation requiring the Social Security Administration (SSA) to make transparent any attempt to close a Field Office (FO) and deprive the public of the service it deserves”, said Paul Demler, President of AFGE Local 3342. I hope those Social Security employees were off the clock. There was an article three days ago suggesting that the Social Security Administration would process the rebate checks that are to be the centerpiece of the economic stimulus plan expected in the next few weeks, but the Associated Press is reporting today that the Internal Revenue Service (IRS) will be doing the processing. It is only a guess, but my guess is that the IRS was trying to pawn this job off on Social Security and Social Security said "No." The government might be denying Social Security disability benefits to hundreds of thousands of people who should be getting them. That's according to one local congressman, who said he believes the government is rejecting valid claims simply to save money. Freshman Rep. Jason Altmire is reacting to a recent network news investigation highlighting the potential problem, and he compared it to another highly criticized policy involving military benefits. Only after congressional intervention was an emotional Jean Sbaraglia, of Allison Park, able to get the Social Security disability benefits the government spent years denying her. No, I do not think he is any relation to Arthur Altmeyer, a major figure in the history of Social Security in the United States and the man for whom the Altmeyer Building at Social Security headquarters is named. The name is spelled differently. Greg Siskind's immigration blog is reporting that new "no match" rules are imminent. Last fall, a court order blocked the Social Security Administration from sending out a huge batch of letters informing employers of situations in which an employee's name did not match his or her Social Security number. New regulations are being issued to try to address the concerns that led to the court order blocking the "no match" letters. While there may be renewed efforts to block the "no match" letters, there is a good chance that they will go out in the near future. "No match" letters had been sent for years, but there was no penalty for failing to clear up the situation. Mostly, employers ignored the letters. Sanctions are now threatened, so the new "no match" letters are potentially of considerable importance as an immigration enforcement measure. Unfortunately, there will be literally millions of U.S. citizens also affected by the "no match" letters and some percentage of those affected will be contacting the Social Security Administration. No one has any idea what effect the new "no match" letters will have upon the Social Security Administration's workloads. This may be little more than a blip or it may be a tidal wave. The Social Security Administration has been quiet about the potential workload problems that may arise from this. I cannot help thinking that Michael Astrue has been afraid of saying anything, since the "no match" letters are a major part of the President's plan to deal with illegal immigration and illegal immigration is a major issue for Republicans, in particular. The sheer unpredictability of the situation would scare me if I were Michael Astrue. In the Boston area, where the process was tested, 3 percent of the applicants qualified for "quick disability determination," as it's called, according to Social Security. Can someone explain to me what is new here apart from the name? The Social Security Administration has released monthly statistics on Supplemental Security Income (SSI) for December 2007. As a citizen, I wish to register a complaint. If the U.S. government can police the world by keeping troops all over it, it should be able to have more than one window in the local Social Security office. I received two letters from the Social Security Administration concerning a reduction of my 2008 benefits. I wanted an explanation because these letters were very unclear, like most bureaucratic letters tend to be. So, I went down to the Vero Beach office and was shocked to find out there was only one worker and one window to service everyone in town. I was asked to take a ball with a number on it from some uninformed worker at the entrance and to wait my turn. The room was full of people and I was not willing to wait that long for a few simple questions. I even went down a second time and had the exact same experience as before. I heard that Vero Beach had more Social Security checks sent to it per capita than any other place in the United States. So exactly why would there be only one person to service such an area that would have a high demand for help from the local Social Security office? The Vero Beach metropolitan area has a population of 130,100 according to Wikipedia. After spending more than five decades in a cramped office at the federal building in Port Huron, the Social Security office is moving. Starting Monday, the Social Security Administration will be at 2620 Krafft Road in Fort Gratiot. .. The office at the federal building is 8,000 square feet compared to the 12,000 square feet available at the new building. The Substance Abuse and Mental Health Services Administration of the Center for Mental Health Services of the U.S. Department of Health and Human Services has written a 202 page manual entitled Stepping Stones to Recovery: A Case Manual for Assisting Adults Who Are Homeless With Social Security Disability and Supplemental Security Income Applications. While it is a good manual, it does miss the crucial issue of how Social Security deals with cases in which it is impossible to tell what part of a claimant's limitations is due to drug abuse or alcoholism and what part is due to other mental illness. This is a common problem when one is trying to help substance abusers, who are a high percentage of the homeless population. Would This Do Anything To The Social Security Disability Programs? Businesses can't count on a veto by President Bush to stop the measure. The original ADA was part of his father's legacy, and he may be reluctant to block an expansion. But the president, with backing from Senate Republicans, is likely to push for changes to make the legislation less onerous to employers. One possible compromise would include adding a list of diseases and conditions that would be covered by the ADA. It would not be an exhaustive list, but one designed to limit the scope of the bill. Because of the short legislative calendar this election year, the bill may not make it through Congress in 2008. If it doesn't, it's a good bet for 2009. And if Democrats win the White House and expand their majorities in the House and Senate, the eventual bill will be tougher on employers than if Republicans can force a compromise this year. SSA Role In Economic Stimulus? The Social Security Administration sends out nearly 50 million checks per month, but its computer systems have needed updating for many years. Nevertheless, Social Security Administration Commissioner Michael J. Astrue said supplement checks could be processed and distributed in about six weeks. And what would processing economic stimulus checks do to ordinary workloads at Social Security? Lisa Worobey likes to work. The Bureau of Disability Adjudication in Carson City has undergone some key changes since a Reno Gazette-Journal article chronicled the agency’s problems in 2006. Nationally, the Social Security Administration launched a couple of initiatives to help states speed up the disability application process, said Lowell Kepke, Social Security spokesperson for the San Francisco office. One is hiring more administrative law judges nationwide to hear appeals. Another is a program called Quick Disability Determination, which was officially implemented in Nevada last October. Quick Disability uses software that screens applications based on key health criteria to speed up identification of severe disability cases. The biggest change was the lifting of a freeze on reviews in the Carson City bureau of cases under appeal. The freeze was initially ordered as a way to ease workload pressure on overstretched staff and allow them to focus on reviewing new applications, said Kraig Schutte, chief of the Bureau of Disability Adjudication. . But the move led to a backlog of nearly 5,000 cases in the appeal stage — 2,800 of which involved “reconsiderations” or the first level of appeal and 2,149 for cases under continued review. The freeze was eliminated in September 2006, plus the bureau got assistance from the Social Security Administration to clear the backlog of appeals, Schutte said. As of last week, the bureau has trimmed its backlog for reconsiderations to 146 cases. The backlog for cases under continued disability review saw a similar significant drop to 152. Social Security also lifted a hiring freeze that was causing vacant positions to accumulate at the bureau. This bumped up staffing from 37 to 45, Schutte said. As a Social Security employee who retired after working for the agency for almost 29 years, mainly as a benefit authorizer, I would like to make an observation regarding the processing of disability benefits. After the agonizingly lengthy procedure involved in approving disability claims (even if they are not denied), the final product, a disability award, must be processed by a benefit authorizer before benefit checks can go out. It is at the point that the Social Security Administration plays a final cruel joke on many successful disability applicants. To wit: the authorization process is delayed, unnecessarily in my opinion, because benefit authorizers, who are the only ones who can perform the benefit authorization function, are frequently forbidden to perform this function for long periods of each work week. Instead, the B.A. 's [Benefit Authorizers] are forced to "spike," i.e., answer phone calls from the public, the majority which deal with SSI eligibility and payments, which have nothing to do with Social Security. In effect, B.A. 's are being forced to act as babysitters instead of being allowed to perform the job for which they and they alone have been professionally trained. I think you will agree that this situation is a grave disservice to both the disability claimants and the B.A. 's who should be authorizing their claims. I would appreciate it if you would make this administration policy known to your readers and to the general public. Only a public outcry could put pressure on Congress and on the Administration to do away with or at least modify drastically the Administration's pernicious and wasteful "SPIKE" policy. My impression is that the BAs do not do such a great job at answering the phone either, since that is not the job they were trained for. Four Nuggets From The "Plan To Eliminate The Hearing Backlog And Prevent Its Recurrence"
Here is a nugget from the recently released "Plan To Eliminate The Hearing Backlog And Prevent Its Recurrence." Because of changes in Executive personnel responsibilities in late June, Ron Raborg, Deputy Chief Quality Officer, OQP, replaced Alan Lane, and in August, Roger McDonnell, Assistant Deputy Commissioner for Operations, replaced Mary Glenn-Croft. It was estimated that approximately 20% of the remanded cases [under the informal remand or "re-recon" process] would be reversed by the DDS. By the close of FY 07, 8,714 favorable determinations had been returned by the DDSs and 7,413 cases were returned as “No Decision” by the DDS. This was a 54% reversal rate. Traditionally, management information for the hearing operation has been reported on a monthly basis. While reasons exist for this approach, it may result in delays in case processing as employees process more cases at the end of the month to meet monthly goals. In FY 07, the Chief Judge has been strongly encouraging managers to monitor workload processing data on a weekly basis and ODAR continues to develop workload reports to monitor hearing office performance this way. The Office of the General Counsel, Office of the Chief Administrative Law Judge, Office of Appellate Operations, and Office of Labor Management and Employee Relations have been meeting regularly to make immediate improvements under current rules and to clarify the complaint process for claimants. The group has completed changes to current notices, posters, associated pamphlets, and the website that outlines how to file an unfair treatment complaint. The group continues to study the process and to consider improvements that will involve regulatory changes. 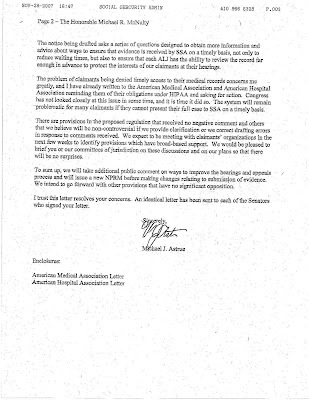 The goal is to make the ALJ complaint process both fair and effective for SSA, the ALJs and the American people. In FY 07, the Office of the Chief Administrative Law Judge took a more pro-active stance in pursuing disciplinary actions based on ALJ misconduct. Biggs Nomination Formally Withdrawn -- Who's Next? The White House on Wednesday withdrew the formal nomination of Andrew G. Biggs as deputy commissioner of the Social Security Administration. Biggs was temporarily appointed last year despite a key Democrat's objections. In April, President George W. Bush used a recess appointment to place Biggs in the No. 2 Social Security Administration job on a temporary basis. Bush acted after Senate Finance Chairman Max Baucus, D-Mont., vowed his panel wouldn't consider Biggs's nomination because of his support for private investment accounts within Social Security. This would allow the President to nominate someone else for the Deputy Commissioner job, with a term to run until January 2013. Comerica Bank has been chosen as the card issuer for the federal government's prepaid debit card service being offered to Social Security recipients. The new system, known as Direct Express, is expected to be rolled out in Texas and several other states in the second quarter of 2008. The Greenville [South Carolina] Social Security Office on Pelham Road is temporarily closed due to water damage. Officials said that the office will be reopened as soon as possible, but they did not estimate how soon the office will reopen. Your comments and observations were interesting and mostly on-target. However, I believe your comment number 7 is predicated on a misinterpretation of the term "Regional Attorney." You base your comment on the assumption that the references to the "Regional Attorney" are, in fact references to the "Regional Chief Counsel" in the Office of the General Counsel (OGC). I believe you are wrong in this interpretation. Regional Attorneys are located in each of the ten Offices of the Regional Chief ALJ, within ODAR, and report to the RCALJ. They may or may not have supervisory responsibilities. Regional Chief Counsels, on the other hand, are the primary OGC executives in each region, and report to the General Counsel in Baltimore. I believe that the Plan's references to Regional Attorneys are references to the ODAR attorneys, not to any attorney (or anyone else) in OGC. To my knowledge ... there have never been any serious discussions about having OGC involved in any substantive manner in the adjudication process. (The closest was the Counsel to Council short-term project several years ago. Even then, OGC had no discretionary involvement in the outcome of any individual claim). Although your assumptions would arguably be correct if OGC became involved in the hearing process, I do not believe that is the Agency's intent. But some sorely understaffed and underfunded agencies are planning only modest hiring efforts this year. The Social Security Administration — which is at its lowest staffing levels in 35 years and which faces a growing backlog of 747,000 disability claims cases — plans to hire 150 administrative law judges and 92 support staff this year. SSA plans to replace only one of every two state disability determination service employees — who help decide whether people claiming severe disabilities should receive benefits — who leave in 2008. SSA might hire more people, but Commissioner Michael Astrue hasn’t made any decisions yet, spokesman Mark Lassiter said. Eliminate the dedicated account provisions [for children's SSI benefits] and installments [in payments of SSI benefits]. T16 [Title XVI, or SSI] windfall offset reform; allow payment of retroactive benefits of either T2 or T16 payments. Eliminate need for medical CDR [Continuing Disability Review] for age 18 beneficiaries who have a permanent disability or meet a listing. Eliminate the Annual Earnings Test for all retirement claims if a cost analysis shows it to be cost neutral in terms of administrative costs involved in explaining it, administering it, overpayment collection activities, etc. versus drain on the trust fund. Eliminate the concept of SGA [Substantial Gainful Activity] for post-entitlement purposes, and extend the under FRA [Full Retirement Age] retirement work test to disability benefits. Stop medical CDRs on permanent impairments and for all disability beneficiaries over a certain age; and profile only those likely to be ceased. Have attorneys collect their own fees, and eliminate attorney fee withholding by SSA. If that cannot be done increase our fees to a more realistic amount. Put a dedicated computer in SSA FO [Field Office] lobbies for walk-in customers to get online services. Remove local office phone numbers from telephone books and provide the 800# so that this becomes the telephone portal to the agency. Calls could be transferred to local offices when needed. Add a field on 800# screens to collect customer's e-mail address. Also include a field for cell phones as this is a rapidly growing mode of communication for the public. A quality assurance program for the hearing process will provide in line review of the claim file, the scheduling process and decision drafting to ensure that ODAR [Office of Disability Adjudication and Review] is providing timely and legally sufficient hearings and decisions. ODAR has been working with Office of Quality Performance (OQP) to design a process by which a random statistically accurate sample of cases is identified for review. This process is being developed in conjunction with the standardized electronic business process. The Regional Attorneys will be charged with the additional responsibility of overseeing the Quality Assurance (QA) program. They will receive additional staff that will be assigned to the Regional Office, but may be out-stationed to various hearing offices to review claim files at three points in the process. The files will be flagged and reviewed once a hearing has been scheduled and again once a draft of a decision has been prepared. In addition to these two processes the QA process will also involve an in-line review of the Senior Attorney Adjudicator process. QA employees will review the file for certain criteria and make appropriate recommendations to management for correction. In addition, under the direction of the Regional Attorney, they will prepare reports and track trends for training purposes. In some instances they will also be responsible for developing the training. Basically, if you think that 97% of reconsideration denials are accurate, you would love this idea, because it would bring to Administrative Law Judges (ALJs) the same concept that keeps the allowance rate at reconsideration below 15%. This would, in theory, cause the backlog of claimants awaiting hearings to go down, because claimants would have a lower rate of success before ALJs and would have less incentive to request hearings. Probably, most high level career people at Social Security will be hesitant to have their fingerprints on this plan, since anyone promoting the idea could be in trouble with a change in the Commissioner's office. That could easily happen next year. Finding anyone willing to manage even part of this might be difficult. Finding people willing to work in an ALJ quality assurance program would be difficult. It was hard to find people willing to work as Federal Reviewing Officers. Those foolish enough to take those jobs are now twisting in the wind. Their jobs are being eliminated by a new Commissioner of Social Security who is uninterested in his predecessor's plan. Somewhere down the road, the same thing may happen to anyone who takes a job in an ALJ quality assurance program. This would cost a fair amount of money. It is hard to imagine a Congress controlled, even in part, by Democrats appropriating money for this. It is hard to imagine even one house of Congress passing to Republican control next year, much less both. Social Security is already getting media criticism for denying too many meritorious disability claims. An ALJ quality assurance program would lead to more meritorious claims being denied. Implementation of such a plan would result in an incredible amount of media and Congressional attention. What do you think that attorneys who represent Social Security claimants are going to do if a quality assurance program reduces the ALJ reversal rate dramatically? Do you think we would just slink away? No, we would litigate. The last time that the Social Security Administration faced a huge wave of litigation was in the early 1980s when the Reagan Administration tried to cut off disability benefits for several hundred thousand claimants. As best I can recall, the Social Security Administration faced something like 30,000 civil actions a year at that time. Social Security attorneys are far more numerous and far more sophisticated than they were 25 years ago. We could easily give the Social Security Administration a lot more than 30,000 civil actions a year; many times that number, in fact. Could the Social Security Administration handle that? Could the federal courts? It did not take long in the early 1980s for the federal courts to figure out who brought on that spate of litigation and to take forceful action to bring the Social Security Administration to heel. It is hard to imagine any way of implementing a quality assurance program in a way that would not violate the Administrative Procedure Act, unless you make it a government representative program. A government representative program would certainly need regulations and that would take well past the end of the Bush Administration. I have trouble imagining any of the leading Presidential candidates, both Republicans or Democrats, approving such regulations. The Equal Access to Justice Act (EAJA) allows prevailing parties to obtain reimbursement for their attorney fees. There has long been a mistaken belief that Social Security's administrative hearings are exempt from EAJA. Actually, there is no explicit exemption for Social Security. EAJA applies to "adversary adjudications" and adversary adjudications are those in which an agency takes a position. Social Security's hearings have been non-adversial, so EAJA has not applied. This plan is for personnel in Social Security's Office of General Counsel to look at case files before ALJ hearings. For what purpose would they look at the case files other than to "advise" ALJs on how they should decide cases? That sounds a lot like taking a position on the outcome of the case. Take a look at the figures I posted recently about attorney fee payments in Social Security cases last year. EAJA for Social Security administrative hearings could cost the Social Security Administration hundreds of millions of dollars a year -- and no agency gets an appropriation to cover EAJA fees. The one thing that this proposal tells us for sure is that Commissioner Astrue is not planning to bow gracefully to pressure from Congress and the media to do something to help Social Security disability claimants. He seems ready for a fight. I have just learned the Kevin Duggan, who has been an Administrative Law Judge (ALJ) in Charlotte, NC, has been named the Hearing Office Chief Administrative Law Judge (HOCALJ) in Fort Lauderdale, FL. Dear Fixer: In mid-April, the Social Security Administration deposited $11,620 in my checking account by mistake. They insisted it was mine. I said it wasn't. In June, they took away all my Social Security payments, plus part of my husband's. I also have to pay my Medicare separately. After months of trying to resolve this, I received a bill -- for $23,202! I've called a lawyer and my congressman; so far no results. Dear Darlene: The Fixer has wanted to wait to see if they would screw up again and accidentally deposit $23,202 in your account. That would be one way to take care of this bill. Instead, we got in touch with Antonio Henderson at Social Security. Henderson was able to get that enormous bill off your back -- at least most of it. But not before running into a little more red tape. For starters, you said -- even after you paid back much of the $11,620 that was given to you in error -- you were billed $15,111. You also were notified that Social Security would withhold payments until September 2011. After more investigating, the people at the Social Security Administration agreed you owed them only another $5,000 -- an amount you say should be lower, but at least you're getting closer. They've also agreed to resume sending your regular Social Security checks. Well, she did call a lawyer before contacting the newspaper and there is probably a lot more to the story than is in this newspaper article, but I still have to wonder if this lady is getting the help she needs. Where did this remaining $5,000 overpayment come from? Is it possible to get the remaining $5,000 overpayment waived? Will she be getting the regular monthly checks only because she agreed to a repayment schedule for an overpayment that she does not understand and which might be waived if she asked? Is she getting the regular monthly checks only because Social Security is still trying to straighten out this mess? Is the problem really solved or just deferred? In fairness to the newspaper, claimants often seem to omit key pieces of information when they talk with me about overpayments, especially information about their fault in causing the overpayment. HALLANDALE BEACH - When Al Cunningham, a disabled Vietnam veteran, needed help from the Social Security Administration, he drove the 2.27 miles to the agency's office. His five-minute trip just got a lot longer. The agency closed its Hallandale Beach office Jan. 1 and combined it with a larger one 11 miles away at 500 N. Hiatus Road in Pembroke Pines. Carlos Simmons, president of the Hallandale Beach Community Civic Association, said the closing was "not a good thing. A lot of the elderly folks used that office." Hallandale Beach Mayor Joy Cooper said she's gotten several calls from upset residents. U.S. Rep. Kendrick Meek, D-Miami, whose district includes Hallandale Beach, Pembroke Park and West Park, tried but was unable to stop the office's closing. Michael Astrue, an agency official, told Meek in a Dec. 18 letter that combining the offices "will enable us to streamline our processes and provide a more effective and efficient way to serve the public." After nearly four years, Social Security disability applicants can be forgiven for being cynical about the latest pledges to end the backlog that keeps their cases in limbo. This time, however, there is a ray of hope that the reforms will work. The Social Security Administration has a bigger budget from Congress and a newly rediscovered sense of urgency about the plight of the 14,090 applicants in Northeast Ohio who have been waiting for months, in some cases years, for a resolution. The delays are inexcusable. They heap bureaucratic agony on once-proud working people laid low by crippling diseases or accidents. Some people lost their homes, their medical insurance or their very lives before a judge awarded them a disability payment. The latest reforms could unclog this blocked spigot. And other remedies are in the works that focus on technology and personnel. More judges will be added to the Social Security bench, and current judges are giving priority to the oldest cases and using videos at hearings or not holding hearings at all - simply relying on the documents before them. Judges should make sure to use the no-hearings solution carefully, so fraud doesn't flourish in the system. But with thousands awaiting a decision - and a possible tidal wave of dis-abled baby boomers not far down the road - the Social Security Administration has to stop making promises and start delivering on them. The Social Security Administration has released updated data on payments of fees to attorneys and others for representing Social Security claimants. Payments were way down in December 2007. As I mention each time I post this data, it should be of interest not merely to those who represent Social Security claimants. Attorneys and other who represent Social Security claimants are paid at about the same time as the Social Security claimants themselves. When we see a slowdown in payments to those who represent Social Security claimants, we are seeing strong evidence of a slowdown in payments to the claimants themselves. No only do claimants have to wait and wait for adjudication of their claims, they often have to wait for payment after a favorable decision. It was early October when the power company cut off Justin Barber for not paying his bills, plunging the Auburndale man ever deeper into despair over his worsening health. Now in its 39th year, the Heart program also helped Barber catch up on rent, keeping him from losing his modest apartment. The program is for people who have fallen on hard times because of sickness, injury or loss of job and have exhausted other forms of assistance. While applicants are considered on a case-by-case basis, the one constant is that they are people whose circumstances are temporary. His case is a good one, according to experts on Social Security eligibility, and Barber is optimistic of his chances. Meanwhile, however, he has only food stamps and the generosity of others to keep him from being put out onto the streets. Here’s an update on Armen Keteyian’s investigation on the failures of social security disability. Scott Watson, who fractured his spinal cord after a failed back surgery, appeared in our story on Monday, January 14. He was turned down TWICE for federal disability, and has been waiting nearly a year. Now we’ve learned just days after our story aired, he’s been approved. He was told our story DID NOT influence the reversal. Washington - Congressman Joseph Crowley (D-Queens & the Bronx) Wednesday questioned the Social Security Administration about the need to eliminate the backlogs in handling disability casework, as well as shorten or end the 5-month mandated waiting period for eligible Americans to receive Social Security disability benefits. Crowley, a member of the House Committee on Ways and Means, which has jurisdiction over health, tax, trade, Social Security and pension issues, spoke at a hearing on the need for the Federal government to provide more efficient and effective assistance to disabled Americans, including many of our returning veterans. 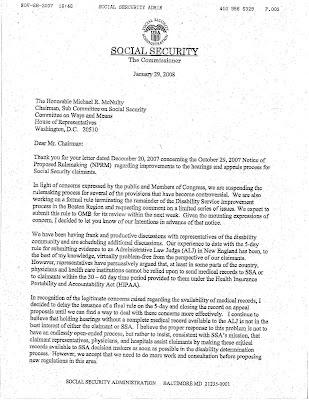 At the hearing, the Social Security Administration stated that they had not planned on reviewing the five-month waiting period before one can receive SSDI, but agreed to review this limit under questioning from Crowley. The case is MetLife v. Wanda Glenn, 06-923. Oral arguments in the case haven't yet been scheduled.